Reviewer: 6’2” , 210 lbs. To kick off our 29’er trail fork review series, we’ll start with the 2015 RockShox Reba RL, which received a cosmetic update from 2014 in the form of anodized black stanchions and new stickers. The RockShox Reba is a stalwart in the RockShox line, with a 29’er version dating back to 2005. It has seen a number of updates over the years, including updates to the valving, air spring, and lowers, and the addition of a thru-axle. The Reba is also one of the most commonly spec’d forks on the market, and is the center of RockShox’s 29’er xc/trail lineup. It shares a chassis with more expensive (SID, Revelation) and less expensive (Sektor) forks, all of which add or subtract bells and whistles compared to the Reba. The lighter and more expensive SID forks use butted aluminum steerer tubes (and carbon steerer tubes on the top model) fork, to save a little weight. The Revelation has more travel, so the stanchions are longer and the crown is slightly different to accommodate the extra 20mms. And the price point Sektor fork has a less machined crown to meet the price, and is therefore slightly heavier. The RockShox Reba RL is one of the lightest forks in our trail fork test, and it feels like it. Its steering, stiffness, and precision are adequate, but certainly not as precise and crisp as many of the other 29’er forks we tested. I felt the front tire slide across flat corners more than with several of the other forks, and the front end felt disconnected and vague when plowing through rock sections. At 200+ lbs, I am probably more sensitive to fork stiffness than lighter riders, but I felt an appreciable difference between this fork and several others in our test. At 46mm, the Reba has one of the shortest offsets (also known as “rake”) in the test, and it is surprisingly noticeable. Offset is how far forward the fork’s axle sits from the center of the steerer tube. This is also referred to as the amount of rake a fork has. 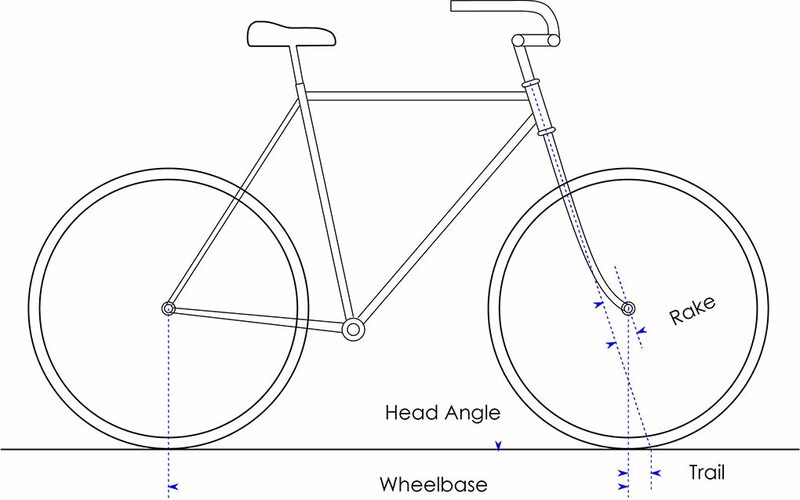 As seen in the image below, trail is the distance between the headtube angle, projected to the ground, and the center of the contact patch of the tire (which is directly below the fork’s axle). More rake = longer offset = shorter trail, which gives a bike a bit more perky and responsive handling. My experience was that this fork has a slightly more nervous feel riding in a straight line, while at the same time, it’s a little less responsive when moving the bike laterally. My experience with longer offsets (i.e. 51mm) is the opposite: the ride is more stable and more responsive. This small (5mm change) amount of offset change was not something I was expecting to notice, but at least with the Reba RL, I was pretty aware of it. The RockShox Reba RL was upgraded to a new Solo Air spring for 2014, and that spring is also used in the 2015 model. The Solo Air spring utilized in the Reba is a relatively simple system that pressurizes both the positive and negative air chambers in the fork via a single valve. The upside to this system is that it is easy to use, and alleviates problems with people incorrectly setting their negative air pressure. The downside is that it’s a bit less tunable. The Solo Air spring on the test fork rode smooth and stiction free out of the box. However, in its stock form, I found the air spring to be too linear for my taste. By overly linear, I mean that at an appropriate sag (18% of travel while standing), I would use too much travel and bottom out the fork on fairly small features. To get enough support with the stock arrangement, I needed to run less than 10% sag, which made the fork overly harsh for my riding style. RockShox now offers “Bottomless Tokens” meant to solve this problem for some of their forks that thread into the inside of the air valve. These tokens take up space in the air chamber, and this makes the fork more progressive, or firmer later in the travel. Unfortunately, these Bottomless Tokens were unobtainable for the Reba anywhere during my test window. So to address the problem, I ground a small cylindrical piece of plastic (a RockShox All Travel spacer) to size, and superglued it to the inside of the cap, which functionally had the same effect as installing a single Bottomless Token in the fork. This mod really helped control larger hits for me, and I was finally able to settle at 15% sag as a good compromise between sensitivity and support. This also lines up with RockShox’s guidelines, which indicate that shorter travel forks will often ride best with more bottomless tokens. Very nice review! I’m at Clyde and I just got this fork stock on my bike. I was considering whether I should sell it or replace the damper with the SID RCT3 damper. The frequent maintenance has me leaning towards selling it and buying a Fox fork.